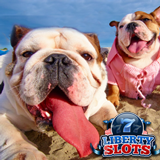 Liberty Slots Casino always has lots of one-day, seven-day and month-long online slots tournaments. This month two daily slots tournaments will pay out $500 in prizes every day. The Dog Days Slots Tournament on now continues until August 15. After that is the August Special. Both tournaments award $500 in prizes every day. The Dog Days Tournament game of the day is listed under the Tournaments tab on the casino’s website: http://www.libertyslots.eu/tournaments. Featured games include Jester’s Wild, Cool Bananas and one of the casino’s most popular games, Amanda Panda. Amanda Panda featured in current online slots tournament at Liberty Slots. Amanda Panda: Jackpot Journey is an explorer-themed slot featuring free spins and a purse-toting lady Panda as its swashbuckling heroine. It has a bonus round where players choose objects to reveal bet multipliers up to x5. This month, Liberty Slots players are earning double comp points playing progressive slot games like Red, White and Win and Mine All Mine. For information on these and other bonuses see http://www.libertyslots.eu/promotions. Liberty Slots offers a large selection of unique slots games from Wager Gaming Technology including the new Lucky Beans, based on the Jack and the Beanstalk fairytale. Many games including Cleopatra’s Pyramid are now also available in the mobile casino for smartphones and tablets.